Notice: For customers ordering with a PO, please refer to the following table and use the product SKU's on your PO. Please note that in 2013, the Skype Specification was revised. In this revision the surface type of the test charts has been changed from Semi-Gloss/Luster to Matte, as a measure to reduce specular reflection. The table below indicates the model numbers for the legacy charts, and the corresponding model numbers for the new matte surface charts. Charts are black and white, including a focus star, 20 patch step chart, and include 10:1 as well as 2:1 contrast ratios. As shown on our blog, these charts are first mentioned in Version 5.0 of the Skype™ Hardware Certification Specification. Skype™ is a registered trademark of Skype Limited. As written in the specification, "This chart needs an uniform light emitting surface below the chart, such as a dedicated light box." For this purpose we recommend the GL-16E Lightbox Viewer. This lightbox provides even illumination and features a high frequency ballast to eliminate flicker. This chart, and all our ink jet printed charts have an approximate MTF50 of 5 cycles/mm. Please keep this in mind when choosing the size of chart. 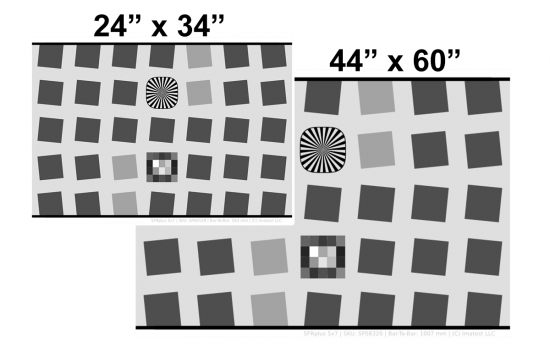 Using a chart that is too small with a high-resolution sensor can result in the MTF of the chart degrading the measured MTF of the camera system.